Many people have asked the question "How long do Fivefingers last?" While I think this is a good question, in principle, it's much more difficult to explain than one might think. And it starts with, "It depends..."
This may sound obvious, but it's foundational to understanding how long you'll have you brand new toe shoes. 'What will you be wearing them for? '—If you're floating in rivers, running on pavement, and hiking through mud the shoes will naturally wear down faster than if you wear them to the grocery store, to class, and to work (if you have that cool of a job). This is rational and you should understand the reasonable implications of your regular activities in the shoes. OK, so I lied. I just told you that Fivefingers last until you wear a hole through them. But the truth is, they can last much longer than that. 'Cause who cares if you have a tiny hole in your shoe? I certainly don't. As long as you don't run/walk downtown (where I frequent), you can wear them even with holes, and your pad will develop nicely to inhibit you from really even noticing. But regardless of whether or not you want to dip into being partially barefoot, I've only had two pair ever wear thru, and they were both Sprints that I wore all the time (the second pair, pictured above, lasted 3 years before obtaining their holes). 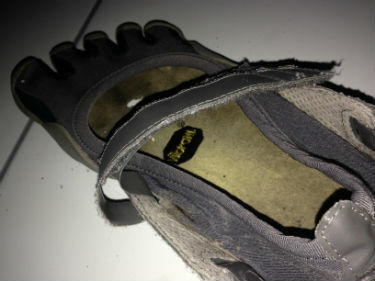 The Trek, TrekSport, Bikila, Bikila LS, KSO, and even the Moc have yet to wear thru—many of which I've had for 3–4 years. Hopefully, you can enjoy their use long after purchase—and appreciate thinking about all the money you're saving from not having to buy new shoes all the time.